Tomorrow marks the 45th anniversary of the abduction of Linda Ann O’Keefe, an 11-year-old girl who lived in Corona del Mar. Linda was last seen alive on Friday, July 6, 1973 as she walked home from summer school. Her body was discovered the next morning in the Back Bay area. Her killer was never found. Starting tomorrow at 7:45 a.m., the Newport Beach Police Department will give Linda a voice once again. 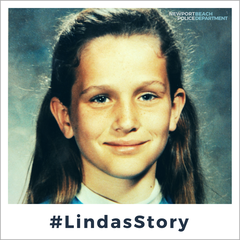 Readers can follow along on Twitter (http://www.twitter.com/NewportBeachPD) as we share Linda’s story. Tweets in Linda’s “voice” will be published throughout the day and into Saturday morning, narrating the last hours of her life. Evidence, including photographs from the original investigation and a new Parabon Snapshot* of the suspected killer, will be included throughout the event. The tweets will culminate in a video overview of the homicide case, as told by the detectives who have been working on this investigation. Years have passed since this heinous murder, but the NBPD remains dedicated to justice for Linda, and committed to finding her killer. This is an open and ongoing investigation and no additional details will be available at this time. Anyone with information on this case is encouraged to call our Cold Case Tip Line at 949-644-3669. Newport Beach Police Department investigators have recently sought the services of Parabon NanoLabs (Parabon), a DNA technology company in Virginia that specializes in DNA phenotyping: the process of predicting physical appearance and ancestry from unidentified DNA evidence. Law enforcement agencies use the company’s Snapshot DNA Phenotyping Service (Snapshot) to narrow suspect lists and generate leads in criminal investigations. Using DNA evidence from this investigation, Snapshot produced trait predictions for the suspected killer. Individual predictions were made for the subject’s ancestry, eye color, hair color, skin color, freckling, and face shape. By combining these attributes of appearance, a Snapshot composite was produced depicting what the suspect may have looked like at 25 years old and with an average body-mass index (BMI) of 22. These default values were used because age and BMI cannot be determined from DNA. An age-progressed version, showing what the suspect might look like today, was also prepared by Parabon. It is important to note that Snapshot composites are scientific approximations of appearance based on DNA, and are not likely to be exact replicas of appearance. Environmental factors such as smoking, drinking, diet, and other non-environmental factors – e.g. facial hair, hairstyle, scars, etc. – cannot be predicted by DNA analysis and may cause further variation between subject’s predicted and actual appearance.